Convenient St Matthews Location - Across from Shelbyville Rd Plaza! First floor unit - Spacious 2 bedroom, 2 bath, eat in kitchen, dining area, living room, all in neutral colors. Seller is planning to leave kitchen appliances: stove, refrigerator, and dishwasher. Unit has laundry hookups. Community has club house, swimming pool, and extra laundry facilities. Monthly maintenance fee includes a/c, heat, water, sewer, garbage, exterior maintenance, master insurance, and pool maintenance - you pay only your personal electric. Extra storage in building across the courtyard. Small pets allowed. 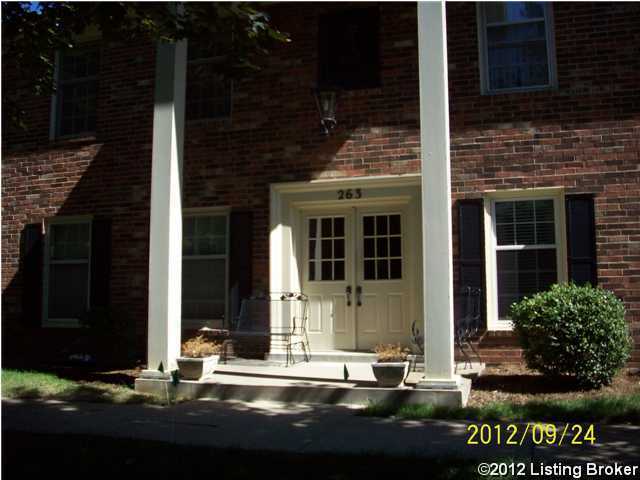 Call today for an apptmt to see this desirable condo home. Stonehenge is a subdivision within the city of Louisville, Kentucky. There are currently 0 Homes for Sale within Stonehenge, with asking prices ranging from $0 to $0. The average list price per square foot of the available inventory in Stonehenge is $0, which is the Louisville average of $156. The Average Sales price of all sold real estate in this subdivision for the past year is $106,489. Recent comparable homes have been selling for 97.02% of their asking price. Waterfront homes represent of the available Stonehenge inventory. The population of Louisville, according to the 2010 Census, is 597,337. The total number of households in the zip code of Stonehenge is 13,905, with an average household size for of 2.13 people. The total number of renter households within the zip code of 40207 is 4,301, which means that 69.07% of households in this zipcode are owner occupant households. 263 Salisbury Sq #101, Louisville KY 40207 is a Condo, with 2 bedrooms which is recently sold, it has 1,175 sqft, 0 sized lot, and See Remarks parking. A comparable Other, has bedrooms and 0 baths, it was built in and is located at and for sale by its owner at $ 0. This home is located in the city of , in zip code , this County Other, it is in the Subdivision, and St Matthews are nearby neighborhoods.